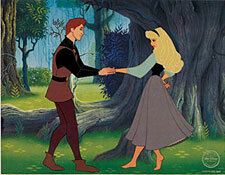 Briar Rose, unaware that she is actually the Princess Aurora, meets a romantic stranger in the woods – also unaware that he is actually her betrothed, Prince Phillip. This charming edition depicts characters from Walt Disney’s classic 1959 animated feature ‘Sleeping Beauty’. The cel recreating Sequence 8, Scene 72 of the film, animated by legendary Disney artists Milt Kahl (who animated Prince Phillip) and Marc Davis (Princess Aurora). Created by the Walt Disney Studios, this edition is a Limited Edition Sericel requiring 23 colors to faithfully capture the look of the original artwork.